Pulp becomes palpable when two contemporary characters enter the world of a trashy romance novel in Her Aching Heart. Harriet and Molly just happen to both be reading the same book, the steamy Her Aching Heart, when their imaginations transport them right into the Victorian world of the trashy tale. Transformed into the wicked Harriet Hellstone and the saintly Molly Penhallow, the women indulge in bodice-ripping affairs, encounter absurd characters and are swept up in passions of epic proportions. Tony-nominated playwright Bryony Lavery has loaded this farce with songs, miracles and send-ups of countless cliches, each one funnier than the last. Lee Mikeska Gardner directs two actresses who portray every character — males included — in this witty and riveting comedy from The Nora Theatre Company. Mary Bichner, who wrote the instrumental arrangements for Her Aching Heart, and is also the Music Director. It was an exciting step to go from quietly admiring Mary’s voice, compositions, and arrangements from afar, to actually collaborating with her! Lee Mikeska Gardner, the new Artistic Director of The Nora Theatre Company and director of this show. She’s got a unique way of combining clarity of vision with openness to change/evolution that I really dig. Excited to see how the Nora itself will evolve under Lee’s vision! Aimee Rose Ranger (my frequent artistic partner-in-crime)and Lynn Guerra, who play all the roles in this two-hander of a show, which is to say, they wear all the wigs, wield all the swords (and cell phones), jump between accents, deliver all of the humor, sing all of the songs, and fall in all of the love. I’m so proud of them! They are awesome! My work in this show is similar in many ways to the songwriting work I did for Whistler in the Dark’s Vinegar Tom—new music, very American in style, set a female British playwright’s smart, pointed, deadpan lyrics. Both plays are funny, but also have something to say about gender, romantic love, feminism, culture…and in the case of Her Aching Heart, also yoga, Kit Kats, and slugs. It’s a fun time. 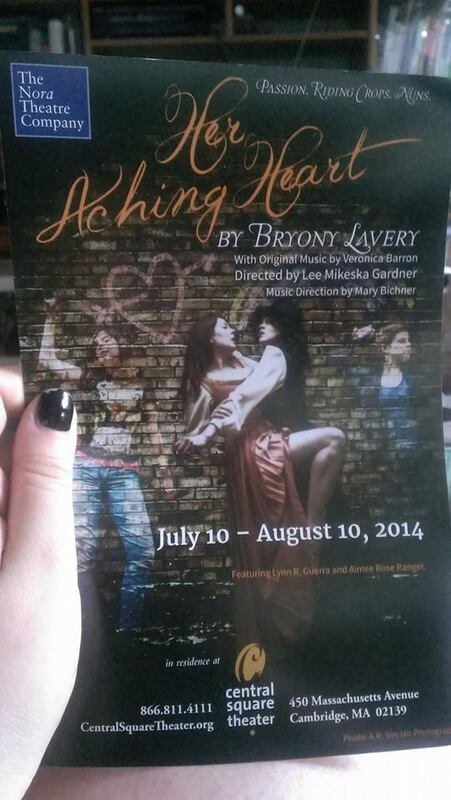 Check out Her Aching Heart through August 10th—details and tickets here! 18 Jul	This entry was published on July 18, 2014 at 4:57 pm. It’s filed under Music, My Work and tagged Aimee Rose Ranger, Bryony Lavery, Central Square Theater, Her Aching Heart, Lee Mikeska Gardner, Lynn Guerra, Mary Bichner, The Nora Theatre Company. Bookmark the permalink. Follow any comments here with the RSS feed for this post.